Answer: As you can see, this is a question I recently asked myself — but could not answer. I discussed it with a few other astronomers in an online forum and now have a solution that makes sense. The key was realizing that my question, as posed, did not make sense. And science can only answer sensible questions. Take a look at my graphic. At the top is a standard textbook ray diagram showing parallel rays of light from some distant object passing through the telescope optics to the observer’s eye. 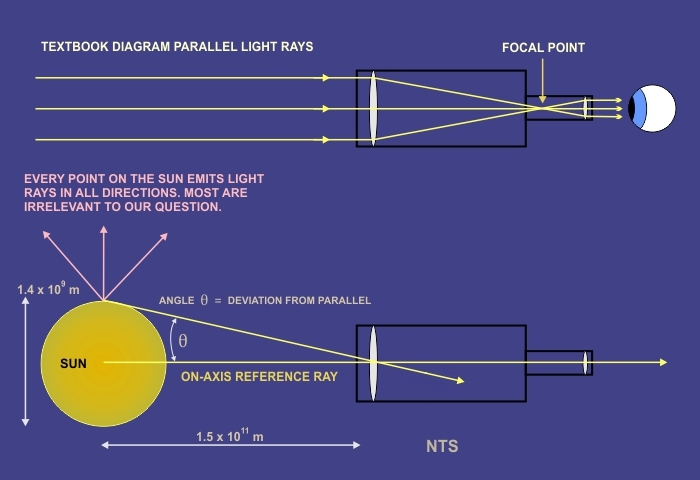 For simplicity, I’ve diagrammed a basic two-lens design known as a refracting telescope. There are other designs but this one is easiest to understand. This is equivalent to saying that the Sun has an apparent angular diameter of Θ = 2 × 0.27 = 0.54°. When we look at the Sun (which we never do without proper eye protection), the angle projected from the eye to opposite edges of the Sun is 0.54°. Any object can be described in terms of angular size. For example, an average height person (1.7 m tall) at a distance of 100 m has an apparent height of Θ = 0.97°. For distant stars and planets the apparent sizes are much smaller. Θ would be measured in arcseconds, where 1 arcsecond (1″) = 1/3600°. But whatever the angular size, if it’s a finite number greater than zero, some of the rays entering the scope must be non-parallel as shown in the graphic. Note this graphic is not to scale: the angle shown is about 20°. Had it shown the calculated 0.27°, the rays would be much closer to parallel. So here’s why my question was invalid: The textbook diagram correctly shows what happens to on-axis parallel rays passing through lenses. What it doesn’t show is how off-axis rays from an object are manipulated to produce a magnified image with a larger apparent angular size. That would require a different ray diagram following the paths of multiple rays from the object to the eye (like this one). But I’ll leave that as a topic for a future post. This isn’t the first time I found my understanding of a concept was incomplete. In many cases the dissonance was catalyzed by a poorly-posed question that seemed to have no answer. When you ask a question, and get an answer that contradicts what you know must be true, then what you “know” is wrong, or the answer is wrong, or the question is invalid. The resolution is often found by examining your assumptions. In this case, I had overextended the implications of a textbook ray diagram designed to explain only on-axis rays.